Even though it is said that health care business is not looked in only for money but like charity, there needs to be some marketing done to promote their service. There is competition in that industry as well. So if you are running a hospital, medical laboratory, or small clinic planning to expand your service, then you must read this. 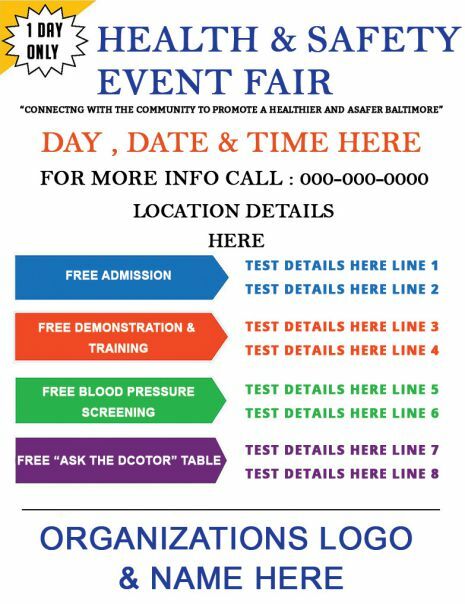 You must look at some options like offering health fair to conduct free health screeners. Alternatively, you can also charge a nominal fee for such activities. Either way, there needs to be a way to let know public about your initiative. There you will need flyers, or posters, or another way to advertise this event. Flyers are the best way as they are easy to make, and cost-effective solution. Let us provide you with insights into what is to be included in the health fair flyers. Along with that, we give you free health fair flyers which you can download and print many copies to sponsor your health fair camp. You can design a flyer within no time using Adobe Photoshop, Illustrator, or InDesign. But some basic time is required to do this. Hence we wanted to gift you with free flyers which are editable. Our small support, for your health fair initiative, considering the well being of people. Now, we will help you with an understanding of what does a flyer consist of. This will allow you to edit the required portion and personalize your flyer. Layout – Every design includes a layout which is nothing but an outline of how it will be arranged. Understand the text and images to be placed in the flyer and select a layout. Care must be given in this first step and help readers get clarity from your flyer. Theme – In simple words, we can call this an idea or subject. You must identify some uniqueness for your service. Which means people should be able to know that it is from you when they look at the flyer. Create a theme for your business and use that every time. In case you like any wordings from the free flyers given here, then use them but retain your theme. Text – Make sure you use the right font and size in the text part. You will be giving the venue details for the health fair. Therefore it is important you make it visible. It is as important as you promote your flyers. It is good to reach many people with your flyer, but bad if they cannot read your content. So keep it simple, and legible. Images – It is a good idea to include images but ensure they are not bulky and covers the text. Health fair flyers should focus more on the message, compared to the image. You can include some images with relevance but not heavy. Colour – The colour combination is very important when you design a flyer. It should not be very bright as well as dull. Choose the right colour to catch the attention of the readers. Getting people to your fair is the objective so plan accordingly. Finally, we are proud to tell you that we have designed all templates keeping these in mind and hence you can quickly download them for your perusal. Wordings in the flyer are optional. You can only let know about the fair details and contact. Sometimes it is good to give a small gist about what is the program about. There you may add the wordings. Look at the different flyers given here to inspire wordings. We have also given some sample wordings for you which you may grab and use in your flyer. Join our free fitness program today and stay fit forever. We will train you to eat the right food as well to add your fitness regimen. Our health fair program is a combo you pay for Zumba and take home free nutrition chart. We have organized for a group of skilled professionals for screening blood sugar and blood pressure. They will then offer you guidance to resume back to normal level. To live a stress-free life attend our free ask the doctor table session. 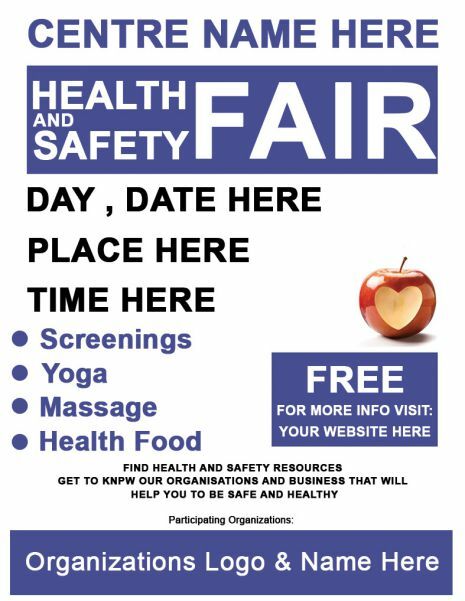 Health fair flyer is used at all places where health is given importance. Needless to say that it is used everywhere. We will give you some specific tips so that you can use these flyers in targeted areas for better response. School Zone – Every day several parents pass by the school to drop and pick their kids. So make sure you give out flyers in those areas and get a better response. Try to hand over flyers during the pickup time as it is a better bet, compared to the morning rush hours. You can also talk to school management and arrange for health checkup for kids and their parents within their premises during a weekend. Church – This is the place where people gather on Sunday for prayer meeting and you will get a great response here. Either make a camp here or meet people to promote your health fair. Alternatively, provide free checkup for all people visiting the church on Sunday. Restaurants – Though people chill out for food. They are conscious about their health. Make use of the opportunity to give your flyers here and let know the people that you care for them. Doctor’s office – A place where both adult and children come to cure their pain. If you can give the health fair flyers in this place and let them realize that prevention is better than cure. Your business will not only skyrocket but you can brand your service as well. It is a good thought to target a community for conducting health camp. Both kids and adults from this society will receive benefit from this health fair. 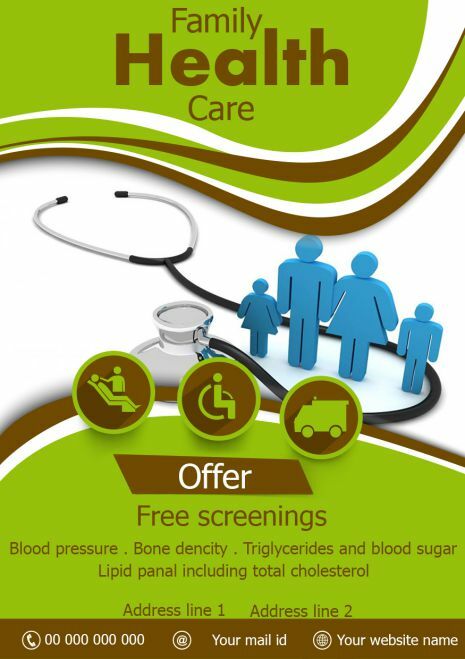 You can announce a day and date in advance by distributing these flyers and arrange for a health screening camp. Wondering how to make a flyer! Just use the flyer given here. This is one designed with bright violet colour writing and bold font on a white background. You can also see a white font on a violet background. This is combination is attractive enough to grab the attention. Further here you can edit and mention your institute name, day and date of the fair. The test details and address. Feel free to include sponsor stickers and logo for additional promotion. 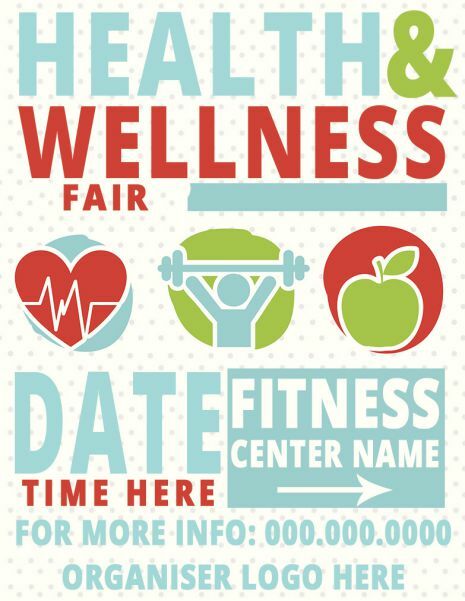 In general, health and wellness fair will include screening, diet, and exercise suggestions. 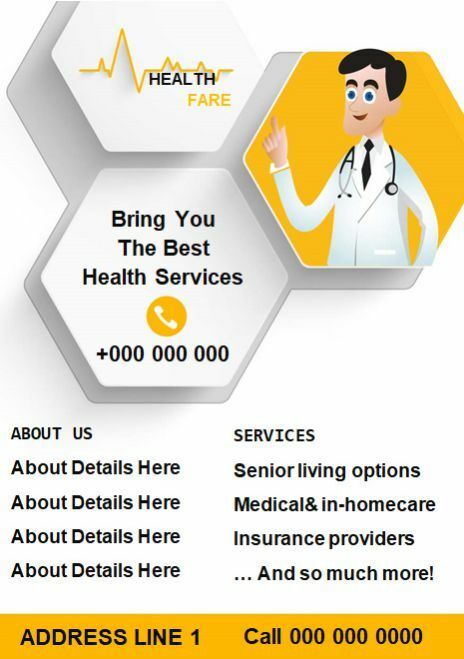 It is a package where one can know their health issues and find a way out to get away from them. For instance, if one is obese, then in this camp you can help them know their BMI and suggest the required food and exercise. Focus more on these type of fair and hence you need to choose the right flyer with typical wordings to help the audience understand the purpose. This one has grey dots on a white background with Heath and Wealth fair written in different colours. You can witness a heart vector designed in red and apple in green. This indicates that the heart condition in danger can be rectified by eating an apple every day. 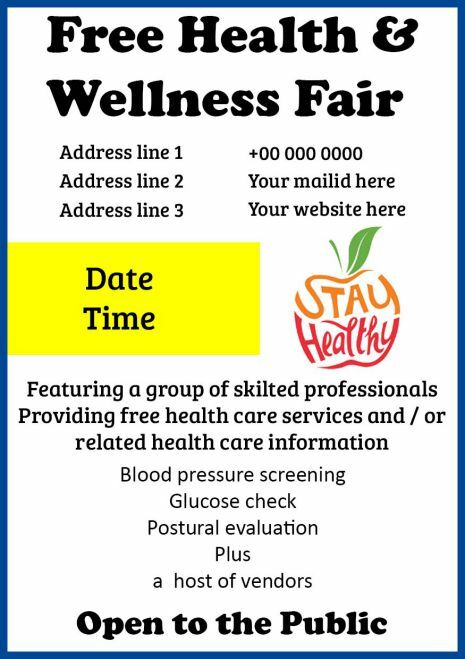 Use this flyer to conduct a health wellness fair. All you need to do is to edit the date, time, contact, and fitness centre details. Another rainbow coloured heart flyer free for your health and wellness fair program. This contains a beautifully designed heart vector and the details of the fair. 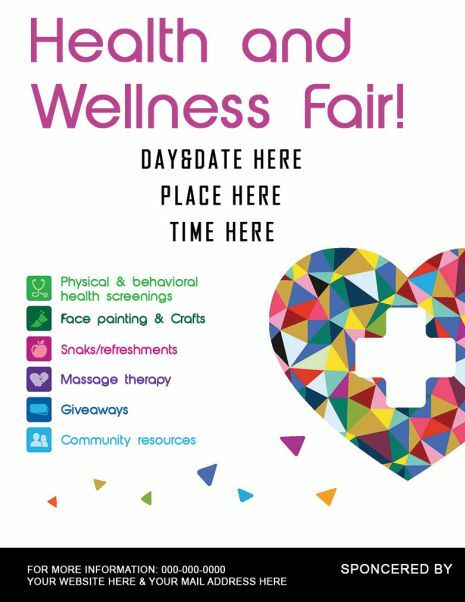 The program consists of physical and behavioural screening, massage therapy, giveaways, and refreshments. You can remove or add to this list and customize with your contact details. Free health and wellness fair flyer is a simple black and white template. Stay healthy wording is designed within an apple. Yellow colour highlights the date and time. Provide your email id, contact number, and address where the fair is organized. Also, it has the screening details which you may opt to retain or edit. Health fair is mandatory for senior citizens. It is not that they are unhealthy, but with age, the immunity goes down. Therefore you must focus on them and arrange for fair. But most important is to reach them. Look for places where they will be available and share the flyers to make sure you cover a larger audience. Three hexagons containing the contact details of the fair and the vector illustration of doctor makes this flyer look good. All the services related to the age-old citizen is mentioned. The yellow colour in the design gives an elegant look. This flyer is specific for age-old ailments like Alzheimer, cholesterol etc. The stethoscope designed as alphabet S indicates senior health fair. 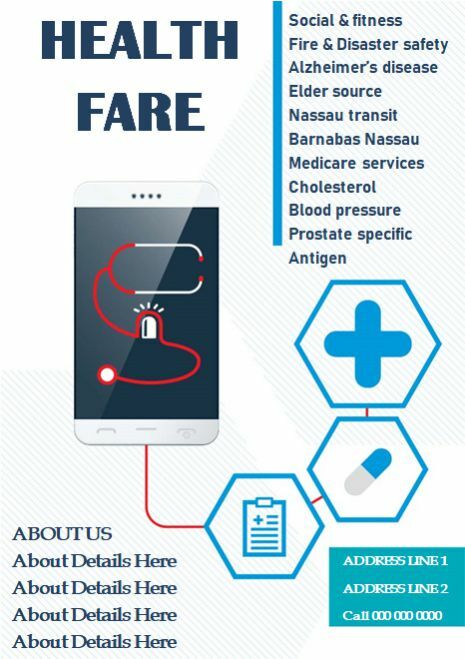 Tablet vectors look real and this is an apt flyer for senior health care service. 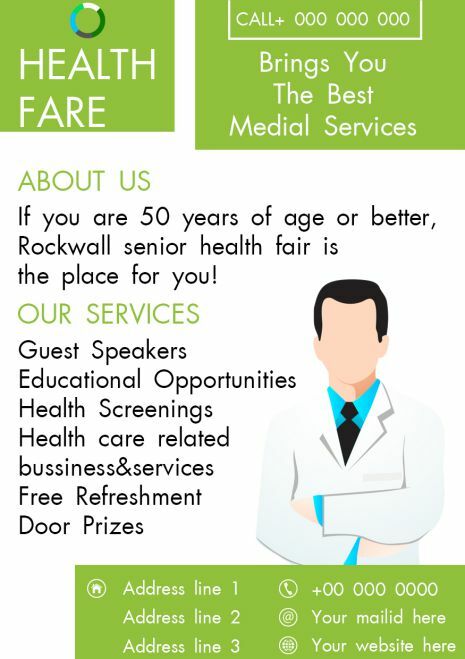 The wording in the flyer is clearly stating that people above age 50 must attend the health fair. The doctor vector looks brilliant on the flyer. Green colour box is the place where you need to fill the venue details with email and contact number. The place where you will find a mass of people is the church and hence get ready with your flyers to meet them. 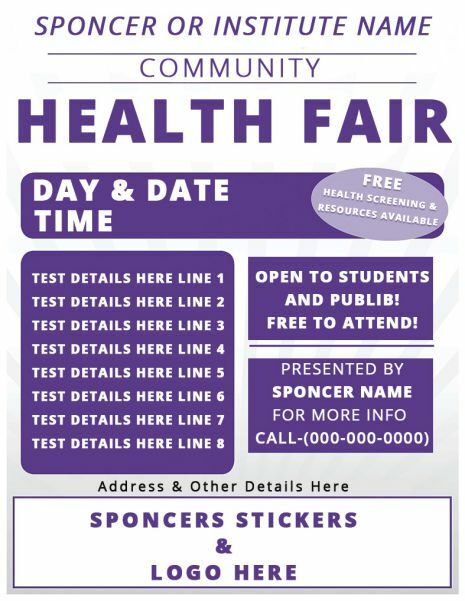 It can be a tie-up with the church community and you can let know the public about the date time and location for health screening activities. The flyer given here looks elegant. 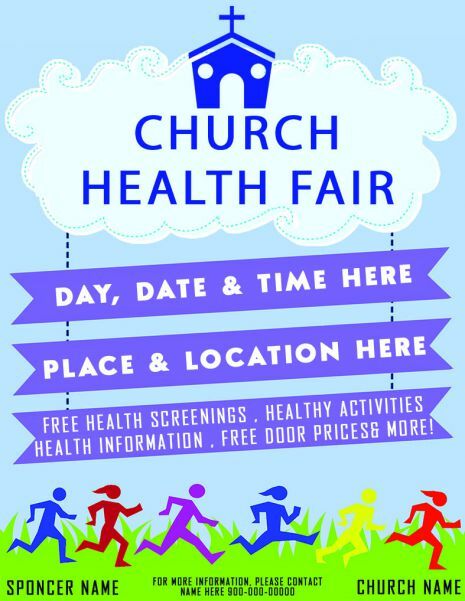 Sky blue background and bold font with legible writing indicating the church health fair. 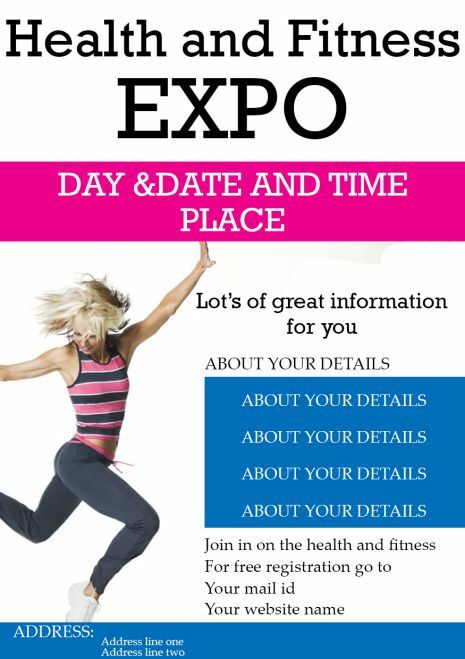 You can edit to mention the day, date and time of the fair. Location details also can be mentioned. At the bottom on green grass, there are several fit people running. This vector illustration really goes well with the goal and feel free to include the church name and sponsor name. The most dangerous yet unknown health complication is diabetes. Many don’t know that they suffer from sugar complaint until it affects them badly. Yes, it is a silent killer. Therefore make sure you conduct regular medical fair for detecting diabetes among people. 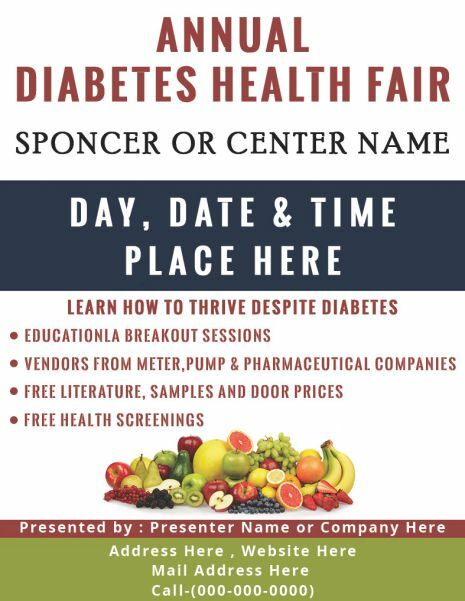 Use flyers for diabetes-specific fair and help the public live healthy. The name implies that it is an annual Every year you want to conduct diabetes camp, and then you must use this premade flyer. It contains all details like the heading, content, and space for date, and venue details. Download and edit details to proceed. The fruits vector illustration makes this flyer look real. Additionally, find some more flyers for a general health fair program. It can include a health and safety program, school health fair, or family fair. Let us see how it looks and the best way to use them. 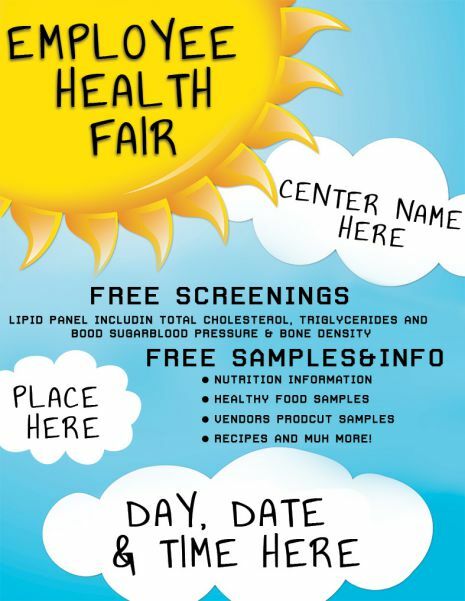 Annual health fair – This flyer is very simple with no design and decoration. It has the pulse vector. The wordings include the heading, date, time, and screening At the end, there is a stethoscope vector and space for the fair venue details. Back to school health fair – Kids have maximum fun during holidays. It’s time to go back to school and it is a good idea to do a brief health checkup. Arrange for a health fair and use this flyer that is brightly coloured in green to attract children. The vector illustration of a schoolboy, school, and stethoscope are really matching the theme. You can talk to school and borrow their conference room as a venue. The snacks vector again is appealing to kids. 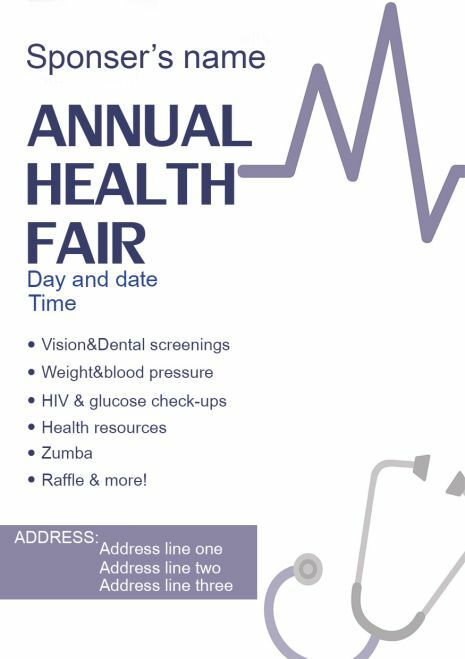 Employee Health Fair – Companies want to provide good health to their staffs and you can approach them to offer employee health fair. This flyer with sun vector and blue colour sky with all wordings written in clouds indicate that the organization wants to see sunshine in their employees face. Reach out to companies with this flyer and you will win the deal. Family health fair – Entire family needs care and just not students and working people. So for the benefit of all at home, this flyer can be used. The 3D man, woman, children vectors in blue are really top. With a green colour indicating wellness and a stethoscope vector stating a health camp. All details described in the drawing. You can edit the contact details to proceed. A cute heart carved in an apple vector is really a great way to let know that Apple is indeed a great food for the good This flyer has all details about the fair including screening, massage, yoga, and diet. Another health and safety event which is valid for one day as mentioned in the flyer. It is a simple flyer with details written in a bold font using different colours. The arrow in various colours indicates details like free admission, training, screening, and consultation. Mention the venue for each in the space given and share your flyer with the audience. 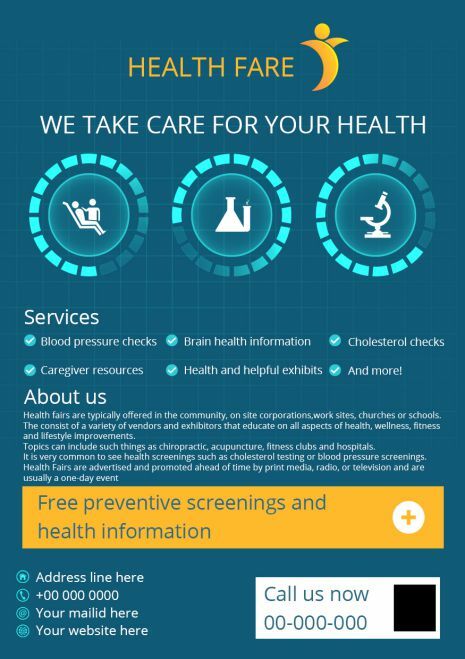 Health Fair Services – You can use this poster for promoting your lab services business. It has a microscope and testing funnels. All services are written in words. Also, a brief write up about your business in writing. You need to download and include your details and print. The dark green background with checked lines gives this flyer a professional look. Women well being – The pink colour border and the presentation tells that this is for ladies. Use this flyer when you provide exclusive screening for women of all ages. 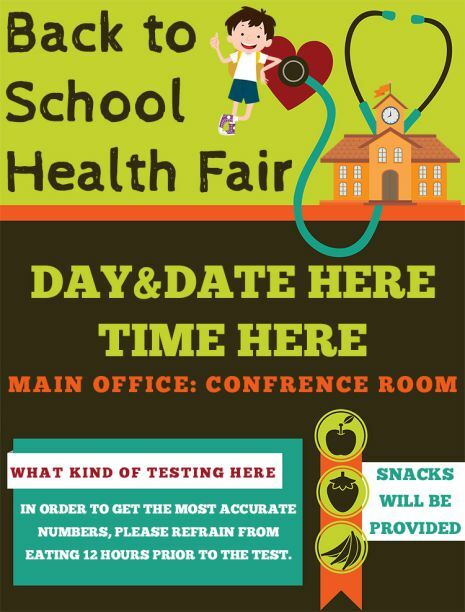 Edit date, month and time to provide health fair details. 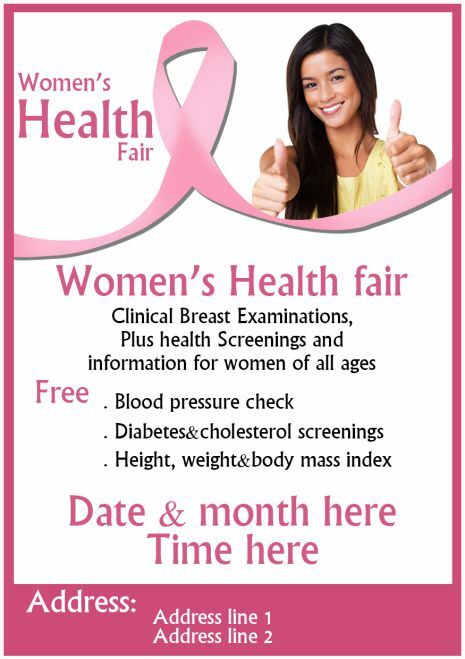 Remember to go with the pink colour to match the theme of women’s health fair. Finally, we have come to the end but feeling glad that we have provided you with 15+ health fair flyers. Pick and choose the required one based on the health fair you are planning to conduct.